’S tric a chluinnear mu staing taigheadais sna làithean seo, anns an Eilean Sgitheanach gu sònraichte, agus ràith thurasachd cho trang ’s a bh’ againn riamh air a bhith ann am-bliadhna. ’S e duilgheadas dha-rìribh a tha seo a sheallas dhuinn a-rithist na thachras nuair a leigeas sinn leis a’ mhargaidh eaconomaigeach cùisean a stiùireadh dha fhèin. Carson a tha sinn fhathast a’ leantainn creideimh eaconomaigich nua-libearalaich anns an RA, dòigh smaoineachaidh a bhrosnaich Thatcher is Regan? Gu dearbha, carson nach eil Alba deònach slighe eadar-dhealaichte a ghabhail? Tha na dùthchannan Lochlannach a’ faighinn buannachd à turasachd cuideachd, ach ma thadhaileas tu air Nirribhidh, mar eisimpleir, aithnichidh tu gu bheil gnìomhachasan is gnothaichean ann ri taobh turasachd, fiù ’s air an dùthaich. Thathar a’ faireachdainn nach eil gach rud aca a’ crochadh gu h-iomlan air turasachd, gu bheil ro-innleachd air choireigin ann a nì cinnteach gu bheil co-chothrom ann is nach fhaigh turasachd làmh an uachdair air an eaconomaidh, a’ tachdadh gach rud eile mar a chithear tachairt ann an Alba. Tha cion-lèirsinn gar dalladh. Chan urrainnear ceistean mu thurasachd a thogail gun daoine an suidheachadh mì-chothromach a th’ againn a dhìon. “Tha sinn ag iarraidh gum bi an t-Eilean fosgailte” (do luchd-turais a-mhàin mas fhìor, is chan ann do luchd-obrach no ar n-òigridh fhèin), “Na bi cur sìos air an àite” (is tu ag amas air cùisean a leasachadh), “Tha luchd-turais riatanach do dh’obraichean” (ma tha sinn toilichte le obraichean ràitheach mì-chinnteach gun àite-fuirich aig na luchd-obrach sin nas motha), “Ach tha iad a’ toirt airgid don sgìre” (is sinne gun mhisneachd gun urrainnear airgead a dhèanamh à dad sam bith eile ach taighean a chur air mhàl is trealaich a reic). ’S àbhaist a-nist do mhòr-shluagh ar dùthcha a bhith a’ coimhead tro shùilean nua-libearalach. ’S e nua-libearalas a stèidhicheas na slatan-tomhais againn, agus ’s e ‘fàs eaconomaigeach’ a gheibh urram thar gach rud eile. Chan eil àite againn airson breithneachadh chàileachdail, chan eil duine againn a chuireas a’ cheist “Cò dha a tha fàs?”, no “Cò as motha a bhuannaicheas?”. Chuala am buidheann thar-phàrtaidh air Poileasaidh Dùthchail, aig Pàrlamaid na h-Alba, an-uiridh bho John M Bryden, ollamh air foghnadh le Oilthigh Obar Dheathain, is e a’ lìbhrigeadh òraid air Poileasaidhean agus Toraidhean Leasachaidh Dhùthchail, Nirribhidh (1). Rinn an t-Ollamh Bryden soilleir dhaibh gu bheil amas aig luchd-poileataigs san dùthaich ud gum bi co-chothrom sgìreil aca. Nas motha na sin, ’s ann air ìre bith-beò agus so-sheasmhachd a tha sin stèidhichte a bharrachd air fàs eaconomaigeach. Tha plana gnìomh aig Riaghaltas Nirribhidh airson na h-amasan aca a choileanadh, is iad a’ cur air dòigh na rudan a tha dhìth orra, gu sònraichte ann an àitichean ‘iomallach’; eadar-cheanglaichean, rathaidean, aiseagan, ceanglaichean adhair, eadar-lìon banna-leathainn, is msaa. Tha iad a’ tuigsinn gur e obair an Riaghaltais a bhith cur an aghaidh miann a’ mhargaidh gach rud a tharraing dhan mheadhan. ’S e duilgheadas eadar-nàiseanta a th’ ann an turasachd an-dràsda, le àitichean leithid Venice, Barcelona, fiù ’s Dùn Èideann fhèin a’ beachdachadh air cìsean is dè ghabhadh a dhèanamh mu thaighean a tha air mhàl son saor-làithean. ’S ann gu math beag a tha na h-Eileanan Fàrach, 49,000 neach a’ fuireach ann, ach le mu 160,000 a’ tadhail orra am-bliadhna. Thoradh air sin, tha ro-innleachd ùr aca a bhios ag amas air àrdachadh ann an teachd a-steach, seach àireamhan de luchd-tadhail. ’S e an lèirsinn aig cridhe a’ phoileasaidh gum bi gnìomhachas turasachd so-sheasmhach, leantainneach aca, a choileanas feuman an t-sluaigh Fàrach, na h-àrainneachd agus na h-eaconomaidh san fharsaingeachd (2). Tha iad a’ tuigsinn gum feumar a bhith faiceallach agus an cultar, an cànan agus gu dearbh an dachaighean a dhìon. Mar as tric ann an Alba ma chluinneas tu dad ris an canadh tu ‘ro-innleachd’ ’s e gum bu chòir gun togar taighean-beaga no àitichean-pàircidh a bharrachd a bhith againn; fàs, co-fharpaiseachd agus àireamhan (3). Chan eil duine againn ag ràdh nach fhaodadh turasachd a bhith mar phàirt de dh’eaconomaidh eadar-mheasgte, ach tha cunnart ann, le gainnead taigheadais agus àireamhan ro àrd de luchd-tadhail, gun tachd turasachd gach rud eile gus an tachd i turasachd fhèin. Chan eil àitichean-fuirich aig luchd-obrach an-dràsda agus bheir sin buaidh air taighean-òsta agus taighean-bìdh cho math ri gnìomhachasan eile leithid oifigean luchd-lagha is ailtirean, sgoiltean, seirbheisean-èiginn agus ospadalan (4). Tha na h-àitichean tadhail mar Bhodach an Stòir agus Glumagan nan Sìthichean a’ taomadh le daoine mar-thà is ruigidh sin ìre far nach bi iad idir cho tarraingeach tuilleadh. Gun smachd no ro-innleachd a tha mothachail air feuman an t-sluaigh, tha turasachd comasach gach rud a mhilleadh, nam measg choimhearsnachdan a tha cugallach mar-thà, a’ Ghàidhlig a tha fiù ’s nas cugallaiche, gnìomhachasan prìobhaideach agus seirbhisean poblach. Agus mu dheireadh, mar a tha nua-libearalas air sealltainn iomadh turas roimhe, tòcadh is sgàineadh (boom and bust) is mathaid nach bi turasachd fhèin an ìre mhath air fhàgail dhuinn. Tha na h-àitichean tadhail mar Bhodach an Stòir agus Glumagan nan Sìthichean a’ taomadh le daoine mar-thà is ruigidh sin ìre far nach bi iad idir cho tarraingeach tuilleadh. Gun smachd no ro-innleachd a tha mothachail air feuman an t-sluaigh, tha turasachd comasach gach rud a mhilleadh, nam measg choimhearsnachdan a tha cugallach mar-thà, a’ Ghàidhlig a tha fiù ’s nas cugallaiche, gnìomhachasan prìobhaideach agus seirbhisean poblach. Agus mu dheireadh, mar a tha nua-libearalas air sealltainn iomadh turas roimhe, tòcadh is sgàineadh (boom and bust) is mathaid nach bi turasachd fhèin an ìre mhath air fhàgail dhuinn. Ach cha bu chòir dhuinn idir a bhith a’ crochadh air turasachd air a’ Ghàidhealtachd. Tha coltas ann an-dràsda nach eilear a’ smaoineachadh air a’ Ghàidhealtachd agus na h-Eileanan ach mar raon-cluiche do dhaoine beartach is luchd-turais. Ach cleas nan Nirribheach, is grunn dùthchannan eile san Roinn Eòrpa, carson nach ullaich sinn plana eaconomaigeach ag amas air eaconomaidh eadar-mheasgte ann an sgìrean dùthchail? Chan eil ar n-òigridh uile sàsaichte le obraichean samhraidh a’ frithealadh dhaoine ann an taighean-òsta. ’S beag an t-iongnadh gum fàg a’ mhòr-chuid, mura h-eil cosnaidhean luachmhor no taighean aca dè nì iad ach na casan a thoirt leotha? (is an cànan cuideachd). Tha dleastanas aig an Riaghaltas cothroman a thoirt don òigridh obraichean is àitichean-fuirich fhaighinn anns na sgìrean aca, agus ar cultar, ar cànan agus ar coimhearsnachdan a dhìon agus a leasachadh. Tha seo fìor airson gach pàirt den dùthaich is chan ann a-mhàin do fhrith-bhailtean nam bailtean-mòra. Tha cothroman ann ann am pailteas, fiù ’s ann an sgìrean mas fhìor iomallach, gnìomhachasan ùra seasmhach agus luchdmhor a stèidheachadh, mar a thachras air feadh an t-saoghal ann an dùthchannan nach eil air ghèilleadh buileach glan don mhargadh shanntach nua-libearalach. ’S urrainnear teicneolasan a leasachadh leithid Fiodhrach Crois Lannaichte, CLT (Cross Laminated Timber) (5) no ionsulaideadh fiodhrach snàithleach (wood fibre insulation) (6) fo stiùireadh an Riaghaltais an toiseach, ach le bhith a’ dèanamh sin bhiodh gnìomhachasan mu thimcheall an leithid a’ toirt obraichean math do dhaoine is a’ cur a-steach don eaconomaidh san fharsaingeachd. Mar an ceudna, tha cothrom ann an cuaraidh sglèat aig Baile a’ Chaolais fhosgladh a-rithist, chan ann aig meud coimeirsealta, ach aig ìre bhig ionadail a bhiodh a’ frithealadh ath-nuadhachadh air togalaichean liostaichte, nuair a fheumas tu sglèat dùthchasach à Alba a chleachdadh (7). San latha an-diugh nan cuirte air dòigh bun-structar ceart mar eadar-lìon banna-leathainn chan eil mòran ghnothaichean nach b’ urrainn a bhith ann, gnìomhachasan cruthachail, seirbheis no ionmhasail is an leithid. Anns an Eilean Sgitheanach tha Sabhal Mòr Ostaig, is na thòisich Iain Noble aig Eilean Iarmain, air shoilleireachadh gum b’ urrainnear adhartas a dhèanamh le lèirsinn is beagan in-ionmhais. ’S mòr a shoirbhich na Basgaich le companaidh cho-chomainn ris an canar Mondragon (8), ’s luach £22 billean agus le teachd a-steach de £12 billean gach bliadhna. No mar a mhìnich an t-Ollamh Bryden1,Terningen Nettverk (9) ann an Nirribhidh far an stèidhichear co-chomann gnìomhachasan, dàimheil ach diofaraichte, airson leasachadh proifeiseanta is ùr-ghnàthachais ann an sgìre iomallach. Thugar 30 gnìomhachasan beaga ri chèile airson co-obrachadh, pàirteachadh is tomad tàbhachdach a ruigsinn a thaobh in-ionmhais. Nach fhaod modail ghnothachais coltach ri seo a bhith ann an Slèite gus togail air na tha air tachairt mar-thà? No fiù ’s an leithid a’ cur air dòigh às ùr ann an sgìrean eile? Aig ìre bhunaiteach ge-tà feumar luchd-riaghlaidh a bhith ag amas air bun-structar tòrr nas fhearr, mar a leasaichear ann an Nirribhidh; aiseagan, ceanglaichean adhair, drochaidean, tunailean, taigheadas sòisealta agus taighean air prìs reusanta. ’S e cearcall buadhach a bhiodh anns na leasachaidhean seo, ach ’s ann a tha a’ chiad cheum aig an Riaghaltas àrd-amas is lèirsinn a shealltainn airson na dh’fhaodadh a bhith ann. Recently, stories regarding the rural housing shortage have regularly been appearing in the press, particularly in relation to the Isle of Skye, where this year we’ve had another tourist season as busy as ever. This is a serious problem that shows us again what happens when we leave the free market to steward our economy by itself. Why are we still so willing to follow the neo-liberal economic doctrine in the UK, a way of thinking promoted by Thatcher and Regan? Indeed, why isn’t Scotland looking to take a different path? The Scandinavian countries also benefit from tourism, but if you visit Norway for instance, you recognise that industries and businesses operate alongside tourism, even in rural settings. There’s a sense that everything isn’t dependent on tourism, that there is some kind of strategy that ensures there’s a balance and that tourism doesn’t dominate the economy, to the detriment of everything else, as can be seen in Scotland. Lack of vision blinds us. Questions concerning tourism can’t be raised without people defending the current imbalanced situation, “We want the island to be open” (apparently to tourists only and not to workers or our young people), “Don’t be negative about the place” (while you’re trying to encourage improvement), “Tourists are essential for jobs” (if we’re happy with uncertain seasonal work with no accommodation for the workers), “But they bring money to the area” (and we have no confidence that money can be made through anything other than renting houses and selling trinkets). It’s now normal for the majority in the UK to view things from a neo-liberal viewpoint. It’s neo-liberalism which sets our yardstick, and ‘economic growth’ is given prominence over everything else. We have no place for qualitative measures, no one asks the question “Growth for whom?”, or “Who benefits most?”. The cross party group on Rural Policy, at the Scottish Parliament, heard last year from John M Bryden, Emeritus Professor at Aberdeen University, who delivered a speech on Rural Development Policies and Results, Norway (1). Professor Bryden made clear to them that politicians in that country have an ambition to ensure regional balance. What’s more, that balance is based on good living conditions and sustainable regions as well as economic growth. The Government has an action plan for delivering these aims, providing for their requirements, especially in ‘remote’ areas; communications, roads, ferries, air links, broadband internet, etc. They recognise the role of government in opposing the free market’s desire to centralise everything. Internationally tourism has become a controversial issue, with destinations such as Venice, Barcelona, even Edinburgh itself, considering tourist taxes and what can be done to limit houses on holiday let. The Faeroe Islands are particularly fragile, with a population of only 49,000, but with an expected 160,000 visitors this year. As a result, they have a new strategy aiming to increase income, rather than visitor numbers. The vision at the heart of their policy is to develop a sustainable, long term tourism industry, that delivers for the needs of the Faroese people, the environment and the wider economy (2). They understand the need to be cautious in order to protect their culture, language and indeed their own homes. If you hear anything in Scotland that could be termed ‘strategy’ it’s mostly that we need to build toilets or more parking places, growth, competitiveness and numbers (3) . Nobody is saying that tourism shouldn’t be part of a diverse economy, but there’s a danger, with a shortage of housing and too many visitors, that tourism will suffocate everything else until it collapses under its own weight. Workers don’t have accommodation just now and that will impact hotels and restaurants as well as local businesses such as lawyers’ and architects’ offices, schools, emergency services and hospitals (4). The visitor attractions like the Old Man of Storr and the Fairy Pools are packed with people and it will reach a level where they are no longer as attractive to visitors. Without control or strategy that is conscious of the wider needs of society, tourism has the ability to unbalance everything else, communities which are fragile enough already, the Gaelic language which is even more precarious, private businesses and public services. Eventually, as neo-liberalism has shown us many times before, ‘boom and bust’ and we might not even be left with much of a tourist economy. The visitor attractions like the Old Man of Storr and the Fairy Pools are packed with people and it will reach a level where they are no longer as attractive to visitors. Without control or strategy that is conscious of the wider needs of society, tourism has the ability to unbalance everything else, communities which are fragile enough already, the Gaelic language which is even more precarious, private businesses and public services. Eventually, as neo-liberalism has shown us many times before, ‘boom and bust’ and we might not even be left with much of a tourist economy. However we shouldn’t have to be relying on tourism in the Highlands. It currently appears that the Highlands and Islands are only thought of as a playground for tourists and the rich. But as Norway, and many other European nations do, why don’t we prepare an economic plan for the creation of a diverse rural economy? Our young folk are not all content with summer jobs serving people in hotels. It’s little wonder so many leave, if they don’t have access to valuable jobs or proper accommodation what do we expect them to do but move on? (Often taking the language with them). The Government has a responsibility to provide opportunities for work and housing for its citizens in their own areas, to protect and develop our culture, our language and our communities. This is true for every part of the country, not just in the suburbs of our bigger cities. There are ample opportunities, even in apparently remote areas, to establish valuable new sustainable businesses, as happens all over the world in countries that haven’t surrendered completely to the greedy free market. New technologies can be developed such as Cross Laminated Timber (CLT) (5) or wood fibre insulation6 perhaps under the direction of Government at first, but by doing this the industry surrounding these developments would give people diverse and lasting work and contribute to the wider economy. Similarly, there is the potential for the reopening of the quarry at Ballachulish, not at a commercial scale, but at a local level it could service the requirement for Scottish slate on Listed Building renovation projects (7). In this day and age, if appropriate infrastructure is put in place such as broadband internet there’s not many businesses that couldn’t be part of the rural mix, such as creative industries, financial and services industries and the likes. 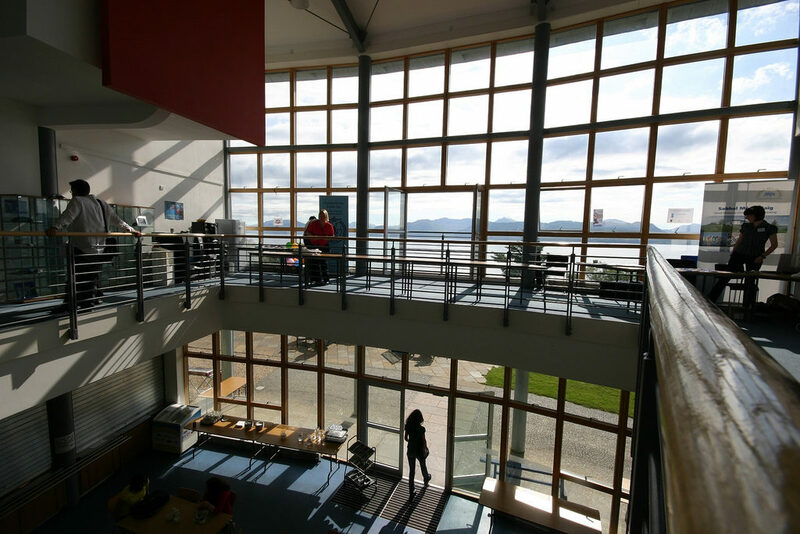 In Skye Sabhal Mòr Ostaig, and the businesses started by Iain Noble at Eilean Iarmain, have demonstrated that progress can be made with vision and investment. The Basques have been enormously successful with the cooperative company Mondragon (8), now worth around £22 billion and with an income of £12 billion every year. Or as Professor Bryden explained1, Terningen Nettverk (9) in Norway where a cooperative was established between diverse but connected businesses, for professional development and innovation in remote regions. 30 small businesses were brought together for collaboration, resource sharing and to reach a critical mass for funding and investment. Might a business model such as this be developed in Sleat to build on what already exists? Or perhaps be newly established in other remote areas? Fundamentally however policy makers must be committed to a much better provision of infrastructure, as is developed in Norway, ferries, air links, bridges, tunnels, social and affordable housing. This investment would be a virtuous circle, however the first step must be taken by the Government, to show vision and demonstrate what can be achieved. Couldn’t agree more and very well explained. I have failed repeatedly to get Visit Scotland to even consider negative impacts of tourism in their ‘economic evaluations ‘ of tourism and they don’t even collect stats which could demonstrate the limitations of part time, seasonal low paid work. Definitely need to encourage a more diverse economy and that needs modern infrastructure. Forestry already playing a part but it would be great if we could develop further the manufacturing of CLT and off site construction.